The fish is speaking to me. The fish in question is staring right at me and I am staring right back at it (sorry, he). He is an ocyurus chrysurus or ‘yellow-tail snapper’. A beautiful silver fish streaked with yellow. This might not be a surprise considering its name, but the yellow isn’t confined to the tail: the top fin is similarly streaked, and a go-faster stripe runs the full length of its body. Perhaps my new fishy friend thinks he is looking in a mirror. I certainly pass a striking resemblance. I am ‘wearing’ (if that’s the right verb for such an unusual device) my bright yellow Breathing Observation Submersible Scooter (B.O.S.S.). Essentially the love-child of a scuba tank, a jet ski and a deep-water diving suit, the B.O.S.S. is a unique piece of kit. Depending on your cinematic frame of reference they either look a bit like the vehicles used by the bad guys in the watery James Bond movies (Thunderball, The Spy Who Loved Me) or giant versions of minions from the Despicable Me franchise. Antony gets the feel of his B.O.S.S. Remember in school when you would turn a glass upside down in a sink of water and no water would enter the glass? It’s the same concept with the B.O.S.S. unit. As you descend, a seal is formed, the scuba tank supplies air to the bubble and you breathe normally. In other words, the B.O.S.S. allows you to explore the ocean without having to wear anything over your face. You don’t even need to know how to swim, as three of our tour group didn’t. That’s because you sit on the scooter just as you would a two-wheeled vehicle on land. I do know how to swim. This is due entirely to the perseverance of my parents. I despised every moment of learning to swim. I once tried to fake my own death just to get out of a swimming lesson. They weren’t convinced by my ‘I’ve fallen down the stairs and broken my neck’ routine. I was therefore forced to become a fairly competent swimmer. The result is, I can stay afloat for a considerable time if I need to. What I will absolutely not do, however, is put my head underneath the water. This has less to do with a fear of water and more to do with intense claustrophobia. Recently being diagnosed with asthma has only exacerbated my life-long hang up about having enough air to breathe. So why did I choose to book something that required me to face my fear head on? Well, as I clicked through the tours available for our forthcoming Celebrity cruise I was becoming increasingly despondent: the most enticing activities involved snorkelling and scuba diving. After all, what’s the point in going to the Caribbean if you don’t spend some time under those crystal clear waters? That’s when I saw the B.O.S.S. tour. The official website goes out of its way to reassure people like me. Even so, I spent some time of YouTube watching the GoPro videos of previous customers. Specifically, I wanted to know how you get into the B.O.S.S. unit. The videos all showed people on the surface, then submerging their heads for two or three seconds before emerging inside their oxygenated bubbles. Surely I would be okay being underwater for two or three seconds? Skip forward a couple of couple of weeks and we’ve just disembarked for our cruise ship, boarded a bus with our fellow B.O.S.S. expeditioners and we’re on our way to the boat which will take us the reef where we will do our underwater tour. The adrenaline is flowing. In this moment, I am not sure this was such a good idea. I don’t say anything to Antony because I know if I say anything aloud this will only make what I’m feeling more real. We are warmly greeted by the captain and his crew, a team of experienced divers who will be accompanying us throughout our entire tour. They instantly instil confidence. Although the crew is mostly male and athletic, there is no macho bravado on display. Safety comes first, followed closely by fun. For the ride out, most of the available seating is taken so I have taken up residence across two large, pendulous buoys. A handsome diver makes a joke based on a comparison between the buoys I am sitting on and pendulous parts of the male anatomy. It’s one of those times where you think of a witty rejoinder just a fraction of a second too late. But the levity breaks the tension I feel inside. On the way to the reef, the captain explains everything we need to know. Being a teacher myself, I appreciate someone who can give clear, memorable instructions to a bunch of potentially unruly people they’ve never met and get them to hang on their every work. He would make a great teacher. Fifteen minutes or so later, a version of these words will come back to me, but this time I will hear them from the mouth of a yellow-tail snapper. Once at the reef, we lightly-inflate our life jackets (a safety step too far for those who can swim? ), drop off the back of the boat, swim out a short distance to the scuba-equipped divers waiting with the B.O.S.S. units. And then it comes time to submerge. Once under, with our heads in the giant bubbles, we use the hand signals we’ve been taught to tell the divers we’re either OK / Not OK / Somewhere in between. In truth, I am not really OK. I am definitely somewhere in between. But I know that if I leave the scooter and rise to the surface there is no chance of me ever getting back in this thing. I stick my thumb up but our diver registers my less-than-OK expression. After checking on Antony he will come back to me. In the meantime, I have locked eyes with my new yellow-tailed friend. He (repeating the words of our captain, with a little extra emphasis) has helped me to calm down. Even at the time, I realise how ridiculous I am being. But if having a conversation with a fish is what it takes to trick my brain into accepting I can now breathe underwater, then so be it. I take a very deep breath, as deep as I can, completely filling my lungs with air. I exhale. I take another deep breath. And another. My heart rate begins to return to normal. When the diver returns, my thumbs up is genuine. We soon start moving as a loose convoy. It takes only a few minutes for me to start enjoying myself. Antony is well away, following the majority of the tour group through the water to investigate a shipwreck. I remember the underwater camera I have attached to my wrist. As soon as we bought it for twenty dollars onboard the boat, I knew I would be the one wearing it. Antony is well versed in my claustrophobia. I’ve lost count of the amount of times he’s had to hold my hand and lead me through large crowds while I’ve kept my eyes securely shut. Putting me in charge of the camera is his way of displacing my fear. It works. I snap away. I surprise myself: in a matter of minutes I’ve gone from being so pumped with adrenaline that I can barely breathe to serenely snapping away at the undersea world. I am so happy snapping that I’m in danger of being left behind by the rest of the group. I press the button which brings the BOSS to life and steer my way back to everyone else. The fish at this reef are so tame because the Aqua Adventures crew feed them so often. Be prepared to get up close and personal. 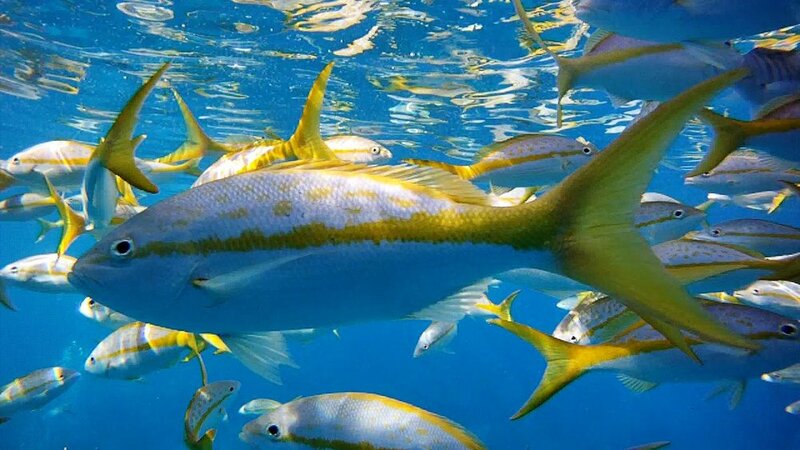 Yellow-tail snappers are just one of many species who have made this reef their home. Towards the end of the tour, we pass the camera over to our divers who are far more experienced than we at taking photographs underwater. They angle us to hit the right light. Even eight feet down, on an exceedingly bright day, much less light manages to penetrate, but these guys know what they’re doing. Say chee... oh wait. The diver taking the photo can't hear us. I'm loving it by this point. Honest. Half an hour later, our tour comes to an end. We feel like we’ve only been underwater for moments. A sure sign that we’ve really enjoyed something. As the other half of our party take their turns on the B.O.S.S. units, we are invited to put on snorkelling masks and flippers. I am inwardly aghast at the prospect, but I feel like I’ve put a decent dent in my fear, at least for today. So I don the equipment, drop off the boat once more and head out to the coral. As soon as my face goes in the water, my brain puts up its familiar fight, but I manage to overcome it for a good fifteen minutes – on and off. I am relieved to get my head fully out of the water each time. I have a harder time taking deep breaths through a plastic tube than the huge oxygenated bubble of the B.O.S.S. unit. And that’s the genius of it. In the sixteen years Aqua Adventures have been operating in St. Thomas, over 100,000 guests have taken a B.O.S.S. Underwater Adventure. I am sure a decent proportion of those were like me, seeing it as a way to see life beneath the sea without having to smother themselves in masks and tanks. One of our party, another claustrophobe like me, says it was the best thing she’s ever done. She is elated that she’s gone through with it. Good reef! We did it! From start to finish, including transporting there and back, the tour takes just under four hours. Having done our underwater tour in the morning, we have enough time left to spend the whole afternoon in the blazing sunshine of St. Thomas. Our activities include a fascinating pirate treasure museum and a delightful rum bar. At the latter, I order a cocktail called a ‘painkiller’, despite not being in any pain whatsoever. On the contrary: I am flushed with endorphins. I’m not stupid enough to envision a time where I will ever be completely comfortable with being under the sea, but, thanks to our B.O.S.S. tour, I can imagine being face to face with some fish again at some point in the future. And for an intense claustrophobic, I think that's a big enough plunge to take for now. We booked our Aqua Adventures B.O.S.S. adventure through our cruise line for £90 each. In addition to Celebrity, you can book a BOSS excursion through any of the following cruise lines: Royal Caribbean, Princess, Carnival, Norwegian. Bartender of the Caribbean: My (brief) time running Bones, a Virgin Islands rum bar.